I would like to start organising Nearly New Sales at Saxon Hall in Raunds, working on a similar basis to the Handmade, Vintage and Gift Shopping Events where one room is for handmade craft items and the other is for a pregnancy and baby/children’s Nearly New Sale. Ideally these will run every other month on a Saturday. At the moment, stalls at my events are £20 and run 10am-3pm. Would people be interested in paying this amount for a Nearly New Sale or would a shorter event for £10 be better – either 10am-1pm or 1pm-4pm? I think this would make a fantastic venue for a Nearly New Sale as the hall is in a really prominent position on the High Street and also there are so many families in this area. Whenever I give out leaflets at local schools I’m always overwhelemd with how many large schools there are in this area and what with all the new housing that’s being built locally I feel there’d be plenty of customers as well as stall holders. I would really like people’s opinions so please do let me know what you think! Either comment here or on the Facebook page or send me an email to rainbowcraftevents@yahoo.co.uk. All set for Saxon Hall! As always there will be refreshments and cakes to enjoy while you shop. Entrance is free and there is lots of free car parking at the hall. So I’ve been busy telling people locally about this event to get as many people through the door as I can! Over 1000 flyers have been sent home with children at St Peters C of E Academy, Windmill Primary School, Stanwick Primary School, Ringstead C of E Primary School, Great Addington C of E Primary School, Woodford C of E Primary School and Alpha Preschool. I will handing out flyers at Raunds Park Infants School, Henry Chichele Primary School, Higham Ferrers Infants and Juniors and Irthlingborough Infants and Juniors over the coming weeks. Adverts have gone out in the Raunds Roundup magazine and Kidz First so 1000s of people will have seen those. Leaflets are always handed out for upcoming events at any of my fairs too. An ad will also be appearing in the Nene Valley News soon. I have advertised the event in the Northampton Chronicle and Echo, Connect FM, Northamptonshire Guide, Wellingborough.gov.uk, thelist.co.uk and Mumsnet. The event has also been shared on numerous Facebook groups and pages. Posters and flyers have also been put up around Stanwick and Raunds so far..! 2 weeks before the day a new banner will go up on the railings of the Town Hall which is next to Saxon Hall and will mean lots of people will see it as they drive down the High Street. I have also bought 2 extra pavement signs and have had posters printed so the 3 signs will also go up at the beginning of April. So what can you do to help?! Please share the event on Facebook and invite or tag friends who live locally. 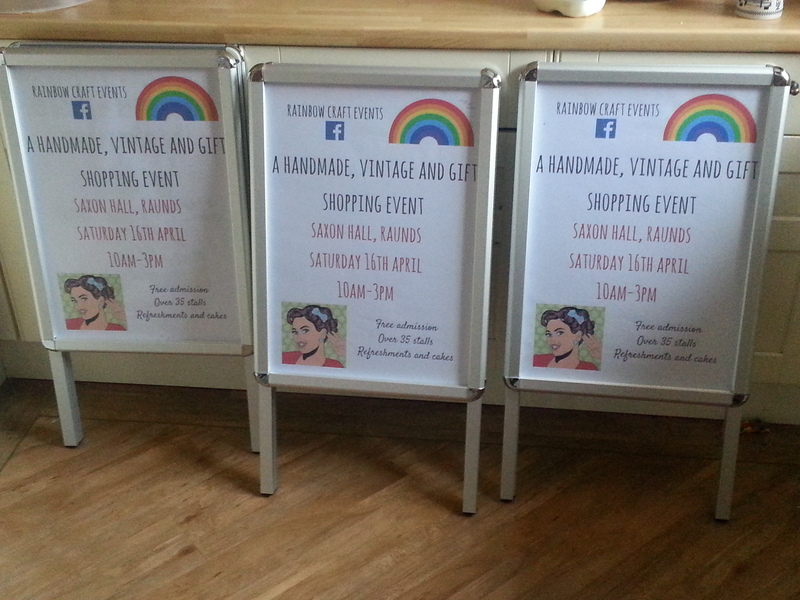 If stallholders have websites they could advertise the event on that would be fab too. Vintage Locket in Rushden who are having a stall are giving out flyers to their customers so if anyone else would like to do the same please get in touch and I’ll provide you with some flyers. Thank you very much to Vintage Locket! What has been absolutely wonderful is when I have been giving out flyers, for example, so many people have said they’ve already heard of the event or seen an advert somewhere. So the word is getting out there and I hope that with each Rainbow Craft Event we’ll continue to grow our customer base who will return to future events. And why not as the stalls we’ve had so far have been fabulous! Thank you lovely stall holders at Kimbolton Craft Fair! Today was the first time Rainbow Craft Events has held a craft fair at The Mandeville Hall in Kimbolton. I was so pleased with the variety and quality of stalls today and received lots of compliments from customers saying exactly the same thing. Everyone helped pitch in and get the tables sorted and we set up with everything looking fab by the time the doors opened! We had a steady stream of customers throughout the day and seeing at it was the first time we’ve been here I think the turn out was pretty good. Hopefully that will only go on to increase with each event we hold here. Lots of customers were asking about the next time we come so that’s a great sign! Thank you to all the stallholders who were giving out leaflets and letting people know about future events.